Located in South Jersey, Camden County’s 227 square miles are filled with urban, suburban, and rural landscapes and historic sites in nearly every one of its 37 municipalities. From Petty’s Island in the middle of the Delaware River in Pennsauken Township to the Peter Mott House Underground Railroad Museum in Lawnside, there is something for everyone in this community. Over 40 historical groups across Camden County recently partnered to create the Camden County History Alliance, a network of historical societies, stately houses, museums, education centers, and other venues. 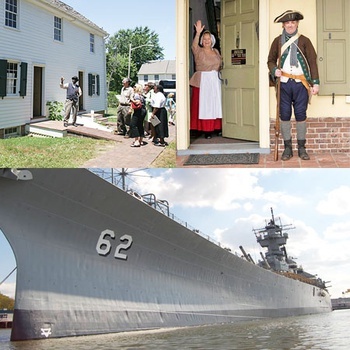 They include some of the county’s most notable landmarks, such as the Battleship New Jersey, which is docked in the Delaware River in Camden and is open for tours, and the Indian King Tavern Museum in Haddonfield, which dates back to 1750. However, some of Camden County’s more hidden attractions that are beginning to gain prominence are also on the list. They include the Long-A-Coming Historical Society's Berlin Train Station and the Esther Raab Holocaust Museum and Goodwin Education Center in Cherry Hill. Donna Harris of Heritage Consulting, who is involved in promoting all that the historical attractions in Camden County have to offer, told Journey Through Jersey that officials are now producing a bi-annual magazine about local history that is distributed at local venues and events and that new historical markers are set to be installed all over Camden County. Harris explained that even though some sites may be off the beaten path, they still are fascinating to visit because of how long they have been in existence and what has occurred there. For instance, the Glover Fulling Mill site in Haddon Heights features the foundation of the historic mill whose customers included Betsy Ross. In addition, for the first time in decades, tours are available of the historic Petty’s Island, a Camden County treasure located between the county’s mainland and Philadelphia. Offered by the New Jersey Audubon and the Camden County Historical Society, these free events require advance registration, but attendees are guaranteed to see a very unique side of this region that is home to wildlife and skyline views. One of the most tourist-friendly aspects of Camden County is that visitors can reach many local attractions without needing to drive. The River Line light rail, which connects Camden County with Burlington and Mercer Counties, costs just $1.60 per ride, and stops near the Battleship New Jersey and the Walt Whitman House in the City of Camden, for instance. Plus, the PATCO High-Speed Line rail service operates between Philadelphia and nine stations in Camden County 24 hours a day, and is a convenient way to reach attractions in communities such as Haddonfield, Collingswood, and the City of Camden. Other parts of the county can be reached on New Jersey Transit buses from Center City Philadelphia and the Atlantic City Rail Line from Philadelphia’s 30th Street Station. Are you ready to plan your visit to Camden County? Visit the Camden County History Alliance's website and Facebook page, check out a map of Journey through Jersey site, begin your journey today!